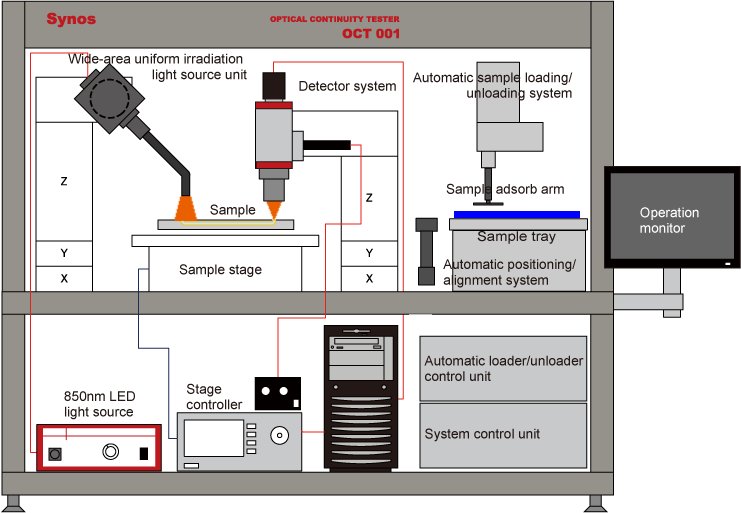 Quick and accurate optical continuity tester for multi-channel polymer waveguide for OPCB substrate with automatic sample loader/unloader system. One-shot irradiation system for measurement light makes it possible to measure continuity on multi-channel polymer optical waveguide at one time. Additionaly, using automatic sample loader/unloader system for separate waveguide module, it is possible to shorten time to set separate OPCB sample onto the measurement sample holder, and improve testing efficiency greatly. Due to this optical continuity testing technology, high-speed optical continuity test for polymer optical waveguide for OPCB substrate is realized at mass production. 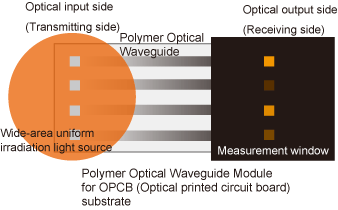 On the OPCB substrate, the signal is transmitted through the con- version of electric signal – optical signal – electric signal between light emitting device and light receiving device mounted on the substrate that forms optical waveguide. Therefore it is mandatory to test optical continuity on optical waveguide. We have developed new technology to incident one-shot stable and uniform irradiation at wide measurement area so that perform highspeed and high-accuracy optical continuity test without optical fiber alignment technology. Our new technology does not require precise positioning such as several μm like conventional optical fiber alignment so that it is possible to incident uniform light rapidly into multi-channel polymer optical waveguide. Captured light should be detected as image signal by high resolution and high dynamic range CCD detector. Only propagation optical intensity signal from optical waveguide shall be extracted and processed with proprietary software having special image processing algorithm. This technology makes it possible for high speed and high-accuracy continuity test on each channel of optical waveguide for multi-channel optical interconnection substrate. This is the automatic mechanism for separate waveguide module to set the measurement station in line precisely from sample tray , and collect it from measurement station to sample trey after continuity test. Normally, in case of testing separate waveguide module, inspector has to set samples in line precisely onto the measurement holder by hand. This preparation process requires extra time for mass production testing for polymer optical waveguide module. By making this process automatic by robot, testing process and time for separate waveguide module is improved efficiently. Separate waveguide samples under test, set onto the sample tray, are adsorbed by robot arm. Samples are set in line precisely onto the measurement station by robot, through automatic image processing and high precision positioning and adjustment technology. After testing, samples under test are collected from measurement station to sample tray. In this time, it is possible to collect NG (fail-judged) samples to the sample tray for NG (fail-judged) sample. Toward waveguide samples set in line precisely onto the measurement station by automatic loading/unloading system, high speed continuity test and pass/fail judgement is executed. In this way, in combination with high speed continuity testing by our optical continuity test system and automatic sample loading/unloading system, mass production testing of polymer waveguide modules for OPCB substrate will be realized. About measurement items, the same test and measurement items as optical continuity tester, such as continuity test, defocusing test, core position and pitch measurement, can be built in. Automatic sample loading/unloading mechanism for separate sample contributes to high speed and efficient test at mass production test for polymer waveguide modules. Optical continuity tester with one-shot irradiation system for measurement light as mass production inspection compliant. Newly developed one-shot irradiation system for measurement light and high NA detection optical system should realize high speed and high accuracy test. Extraction, processing and automatic measurement only for propagation optical intensity signal from optical waveguide with proprietary software. In combination with high precision motorized stage system, it is possible to execute additional function such as defocusing mode measurement, core shape / pitch / position measurement, full-automatic measurement system and so on. High-speed optical continuity test for polymer optical waveguide for OPCB substrate at mass production. Pass/Fail judgement of continuity condition by relative loss measurement and comparison with reference. Area intensity measurement at vertual position of detector. Inclination measurement of 45° built-in mirror in polymer waveguide. About light source unit, please refer to here.